"I discovered it neglected in a chicken run at the back of a pub in Winchcombe. It looked very forlorn for it was covered in chicken droppings, its tyres had perished and there was nothing left of the upholstery except the springs..."
From Landscape with Machines , Tom Rolt's autobiography. 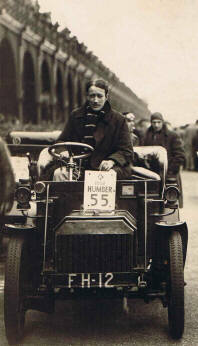 Tom Rolt is pictured here in his 1903 Humber in Brighton on completion of the 1935 London to Brighton Veteran Car Run. Rolt was a co-founder of the Vintage Sports Car Club, which you can read more about on the VSCC website.